Ten-Year Veteran	 Signature LED headlights. Ten-Year Veteran	 Depressions on each side of the carpeted cargo area help keep items from sliding about. Ten-Year Veteran	 Adequate room and comfort for a man of average height. Need more? Acura wants to sell more RLXs. Ten-Year Veteran	 Cushier than a Honda driver seat. But a little less aggressively bolstered than the old TLs. Ten-Year Veteran	 Complicated control scheme requires too many taps for simple operations. Ten-Year Veteran	 The dual-screen plus a knob and buttons interface has found few fans. Ten-Year Veteran	 Aside from the buttons and displays, a cleaner instrument panel design than in previous generations. Ten-Year Veteran	 The Lincoln's interior has its own weaknesses, but at least they tried to do something different. Ten-Year Veteran	 Less plasticky, but now anonymous in character. Ten-Year Veteran	 Even more elegant from the rear quarter. Ten-Year Veteran	 The TLX looks a bit thick from this angle. Ten-Year Veteran	 The Lincoln appeares much more elegant. 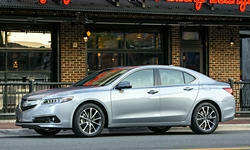 Ten-Year Veteran	 Acura's idea of a sporty-looking sedan. Ten-Year Veteran	 My favorite angle. Ten-Year Veteran	 Feels stronger than 206 horsepower thanks to 8-speed dual clutch transmission. Good sound, too.